For the Sky, Solstice and OpelGT! Just what do you get with our WindRestrictor® brand wind blockers? 1. 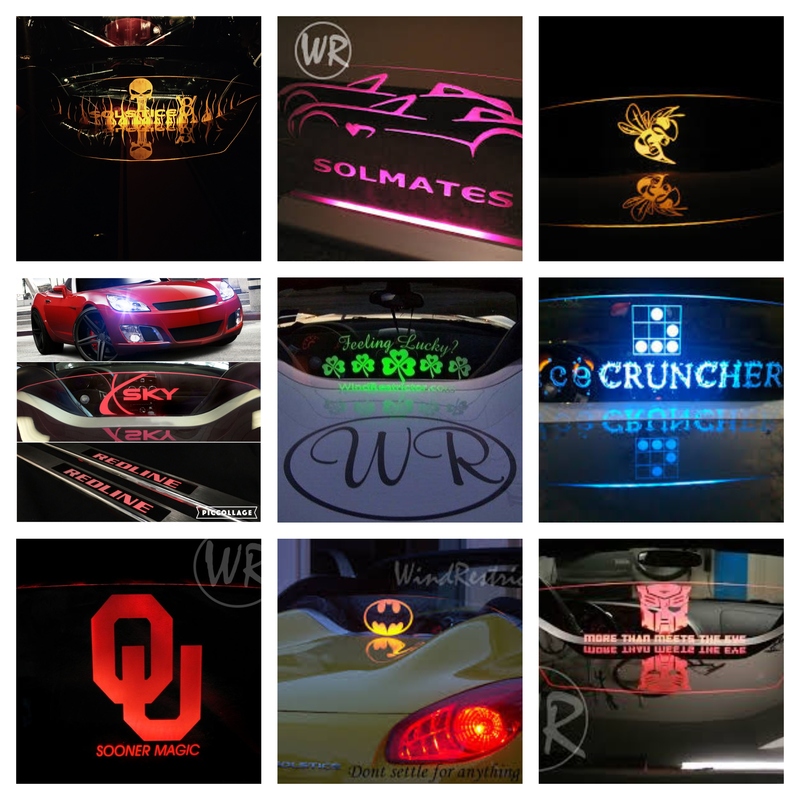 Laser-Etched Graphics: We have both standard and custom options. ANYTHING can be recreated by our art department. We've done everything from family portraits to movie posters. You can't believe what we're capable of. 2. Colored Lights: Our patented design gives you the option to have one of eight colored lights perfectly illuminating your new art piece. You'll notice our design traps the light in. Also, you can get it to match the scheme of your overall vehicle. 3. It Restricts Wind: You'll notice a significant airflow reduction to your car's cabin. Forget rattling and shaking like other models. No yellowing or deep scratches either. BTW We have coupes covered too! Check out our awesome Glowplates! 4. DIY Project: All of our product come with the most comprehensive of instructions. We even have YouTube videos explaining installation for some models. But, if that's not enough, we have 24/7 support on our website. Also, with out accessories we even have more options for making the hook up simple! 5. SAVINGS: Use the link at the bottom to get a FREE lifetime warranty and 10% off your purchase. We're so sure you'll be happy with our product, we're willing to put our money where our mouth is. Questions? Please, DM me right here. Thanks for your time! Last edited by Wind Restrictor; 04-12-2019 at 08:20 PM.